The Greatest Show on Grass Sweepstakes is open to legal residents of the 50 United States and Canada (excluding Quebec), 21 years of age or older. The Greatest Show on Grass Sweepstakes ends on October 22. Completely fill out the entry form online at pgatour.com/greatestshowongrass. Limit one entry per person/email. 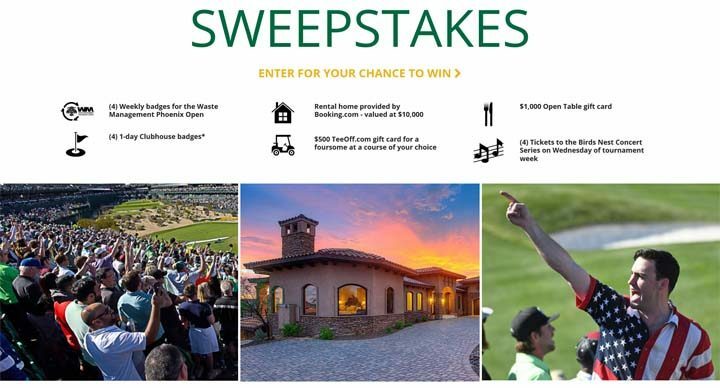 Grand Prize (1): accommodations for four (4) individuals via Booking.com in the Phoenix, Arizona metropolitan area from January 31 through February 4, a $1,000 credit with Opentable.com, a $500 promotional code with TeeOff.com, and four (4) general admission tickets to the 2018 Waste Management Phoenix Open with one day of access to private hospitality. ERV of Grand Prize is $12,900.